I feel this especially when I cook. I'm surrounded and influenced by generations of past cooks, and they encourage me to keep our recipes faithful to their origin, and to cherish and pass on the joys that our culture gives us. alcohol (mostly wine) is consumed moderately. Eating a Mediterranean diet (and exercising) not only helps people stay healthy, it also seems to prolong life, reported Greek researchers. Eating this diet is linked to a longer life expectancy. 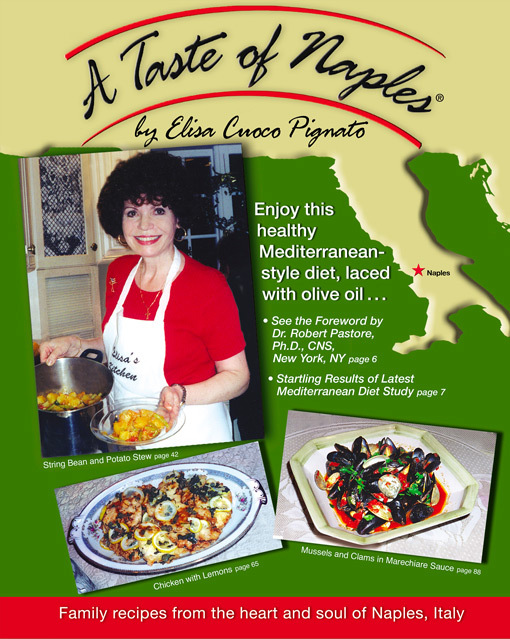 Further explaining the Mediterranean diet is the Foreword to my cookbook "A Taste of Naples" written by Dr. Robert Pastore, Clinical Nutritionist, New York, NY. By Dr. Robert Pastore, Ph.D., CNS. I vividly remember Sunday's in my home when I was growing up. My father, Angelo Pastore, would put his heart and soul into preparing dinner, which would be an all day affair. The menu was always healthy Neapolitan cuisine, created and served with an artistic touch. Unfortunately the tradition died with my father. I'm thrilled that I have a second chance to bring that lifestyle back. 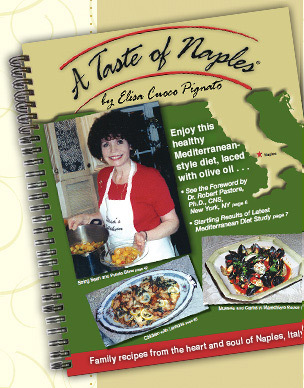 To me A Taste of Naples brings forth a lifestyle that has escaped many of us, especially this proud Italian American. Elisa's work is a perfect amalgam of nutrition and tradition. With its sunny climate, numerous historic and artistic sights, friendly people, great cuisine and a gorgeous natural setting, Naples has long been a favorite destination in Italy for visitors. Elisa brings Naples to our dining room and into our hearts. A Neapolitan menu is a Mediterranean diet. Such a diet is rich in fruits, vegetables, nuts, legumes, olive oil (in my opinion most important) and grains with some fish, meat, poultry and dairy. A Taste of Naples is replete with antioxidants because it represents the Mediterranean diet faithfully. As a clinical nutritionist, I've touted the benefits of olive oil for the past 10 years to patients, students and in articles. For years the press has reported the Omega-3 fatty acids from fish and flax oil are beneficial to the cardiovascular system, and help prevent many diseases. However, few people realize the positive effect that Omega-9 fats have on cardiovascular health and general disease prevention. Omega-9 fats are monounsaturated fatty acids. Olive oil is an Omega-9 fat. Back in 1992, the American Journal of Clinical Nutrition released a study comparing long term monounsaturated fatty acid diets with polyunsaturated diets on good and bad cholesterol levels of healthy men and women. Researchers concluded that polyunsaturated fats reduced bad cholesterol (LDL cholesterol) and good cholesterol levels (HDL cholesterol); while monounsaturated fats (olive oil) reduced LDL, and increased HDL levels (55: 846-850). This is an important fact to understand. Just decreasing saturated fat in exchange for polyunsaturated fats is not the best solution for an optimum cholesterol profile. Increasing monounsaturated fats, such as olive oil, increases good cholesterol, while dropping bad cholesterol for a better cholesterol profile. A study in the New England Journal of Medicine examined the diets of more than 22,000 people ranked according to how closely they adhered to a traditional Mediterranean Diet. During the 4 years of the study, it was found that the closer people followed the traditional diet the less likely they were to die from either heart disease or cancer (New England Journal of Medicine 348:2599-2608, 2003). Numerous studies tout the benefits of the antioxidant rich, monounsaturated fat rich Mediterranean diet. Isn't it time you had "A Taste of Naples?" Copyright © 2019. A Taste of Naples. All Rights Reserved.